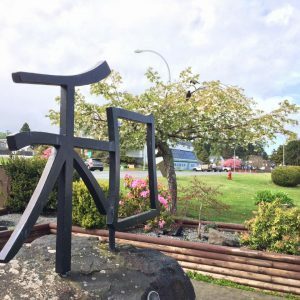 The twinning of Port Hardy and Numata started in 1993 with a letter written from Numata Mayor Hisao Shinoda describing Numata and suggesting the development of a twinning relationship between the two communities. Mayor Al Huddlestan wrote a follow-up letter inviting further exploration of the idea and through this exchange of correspondence began the alliance we see today, one both communities continue to cherish and foster. In September of 1993, a delegation of five, led by Mayor Hisao Shinoda arrived from Numata for a three-day visit. To commemorate twinning, Mayor Shinoda planted a Japanese cherry blossom tree and Mayor Huddlestan planted a BC Dogwood tree on the grounds of the Municipal Hall. The District of Port Hardy and Numata became officially twinned in September 1994 when Mayor Russ Hellberg led a six-member delegation to Numata to sign the Twinning Agreement and to celebrate Numata’s 100th birthday. In 2001, the Council of the District of Port Hardy wished to hand over the day-to-day aspects of twinning to a separate organization – a common practice in other twinned cities. The Port Hardy Twinning Society was formed from volunteers of the Port Hardy Twinning Committee. The Society works hard to make the twinning relationship between Port Hardy and Numata stronger each year. 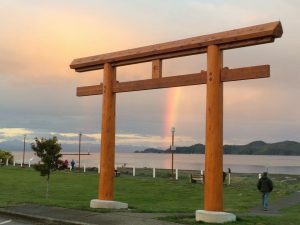 In 2014 the Committee, working closely with the District of Port Hardy raised a torii gate in Carrot Park to commemorate the 20th anniversary of the signing of the Twinning Agreement between Port Hardy and Numata. There have been fewer visits from Port Hardy to Numata, but those students and adults who have gone there have had the experiences of a lifetime. They too have stayed in private homes, have toured the surrounding areas, and visited schools, factories and farms. 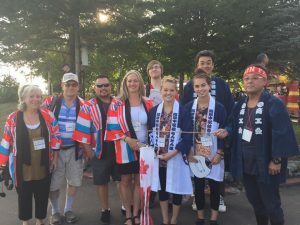 Visitors from Port Hardy have been privileged to learn and take part in traditional Japanese cultural traditions such as the tea ceremony and ikebana flower arranging, as well as the fine art of soba noodle making! Our hosts show us great hospitality, arrange tours in the community and the surrounding cities and area. 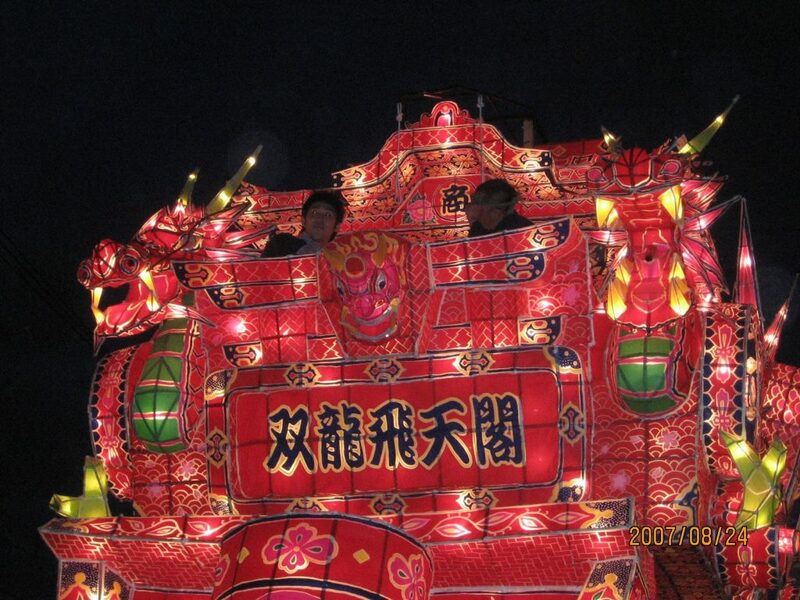 Port Hardy guests have also taken part in the amazing annual Andon Festival held each August in our sister city. 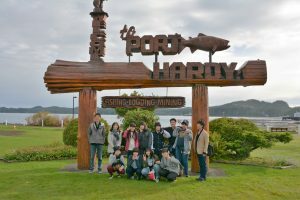 In 1993, when the twinning process began, it was thought to have an economic development function that would open the markets of Japan to local businesses in the resource-based community of Port Hardy. The District and the Twinning Society continue to work towards economic development initiatives as they arise. During visits from Numata to Port Hardy, the Port Hardy Twinning Society works hard to promote Port Hardy businesses and products to Numata through tourism-based activities such as caving, whale watching, harbour tours, town/retail business tours, as well as tours of our local fish processing plants and working forests. We have shipped over $3,000 worth of local products and crafts to Numata for Port Hardy Week. The Society facilitated a contract for a totem pole carved by Calvin and Marie Hunt of the Coppermaker Gallery. The pole was carved in Port Hardy, shipped to Numata and completed there by Calvin and Marie with help from local citizens. It is proudly displayed in the reception area / lobby of the Numata Civic Building. In April of 2004, the Society facilitated meetings between a forestry consultant and a local lumber mill representative with forestry and milling interests in the Numata area.